ab28273 recognises the Carboxyterminal end of the long form of ADAMTS13. Our Abpromise guarantee covers the use of ab28273 in the following tested applications. WB 1/1000 - 1/5000. Detects a band of approximately 190 kDa (predicted molecular weight: 154 kDa). 1/1000, when using colorimetric substrates such as BCIP/NBT - 1/5000, when using chemiluminescent substrates. Detects a band of approximately 190 kDa. Glycosylation and the abundance of cysteine residues gives ADAMTS13 an apparent molecular weight of 190 kDa on reduced SDS PAGE gels. Several bands between 110-190 kDa are observed on Western blots, possibly indicating differentially processed ADAMTS 13. Dilution optimised using Chromogenic detection. Cleaves the vWF multimers in plasma into smaller forms. Plasma. Expressed primarily in liver. Defects in ADAMTS13 are the cause of thrombotic thrombocytopenic purpura congenital (TTP) [MIM:274150]; also known as Upshaw-Schulman syndrome (USS). A hematologic disease characterized by hemolytic anemia with fragmentation of erythrocytes, thrombocytopenia, diffuse and non-focal neurologic findings, decreased renal function and fever. Contains 1 peptidase M12B domain. Contains 8 TSP type-1 domains. The pro-domain is not required for folding or secretion and does not perform the common function of maintening enzyme latency. The spacer domain is necessary to recognize and cleave vWF. The C-terminal TSP type-1 and CUB domains may modulate this interaction. May contain a C-mannosylation site and O-fucosylation sites in the TSP type-1 domains. The precursor is processed by a furin endopeptidase which cleaves off the pro-domain. Glycosylation and the abundance of cysteine residues gives ADAMTS-13 an apparent molecular weight of about 190 kDa on reduced SDS PAGE gels. 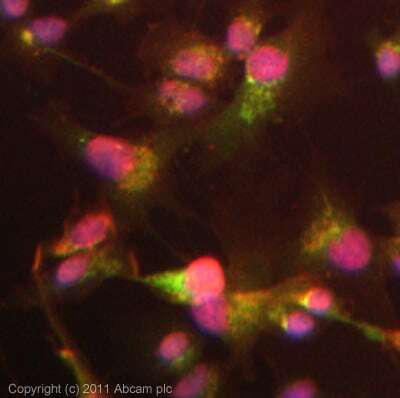 ICC/IF image of ab28273 stained HepG2 cells. The cells were 4% formaldehyde fixed (10 min) and then incubated in 1%BSA / 10% normal goat serum / 0.3M glycine in 0.1% PBS-Tween for 1h to permeabilise the cells and block non-specific protein-protein interactions. The cells were then incubated with the antibody (ab28273, 1µg/ml) overnight at +4°C. The secondary antibody (green) was ab96899, DyLight® 488 goat anti-rabbit IgG (H+L) used at a 1/250 dilution for 1h.Alexa Fluor® 594 WGA was used to label plasma membranes (red) at a 1/200 dilution for 1h. DAPI was used to stain the cell nuclei (blue) at a concentration of 1.43µM. ab28273 has not yet been referenced specifically in any publications. Publishing research using ab28273? Please let us know so that we can cite the reference in this datasheet. Is it possible to get the sequence of this immunogenic peptide? I would like to request a formal quotation for 2 mg of the related antibody ab28273, but I need that information before proceeding. Thank you for your patience in this matter. The originator of ab28273 (ADAMTS13 antibody - Carboxyterminal end long isoform) has informed us that the immunogenic peptide sequence used to raise this antibody lies within the last 35 amino acids of the carboxyterminal end of the full length human protein. We cannot give out the exact amino acid sequence because this information is proprietary. I hope this information helps.